A delicious summer salad made with caramelised Bramley Apples and packed with giant wholewheat cous cous, Wensleydale cheese and walnuts. Cut each of the apples into quarters and then cut each quarter into three wedges. Melt the butter and honey in a frying pan or skillet. Add the apple wedges and cook for 2 – 3 minutes on each side, until they start to soften. Do not overcook them or they will start to fall apart. Cut or tear the lettuce and place it on a large plate. 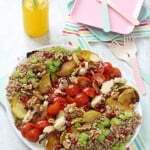 Add the caramelized apples, cous cous, cheese, cherry tomatoes and celery. Sprinkle the walnuts and pomegranate seeds on top.